Security for USB flash drive and external hard disks. Is there a better alternative to Lockngo? Is Lockngo really the best app in Security category? Will Lockngo work good on macOS 10.13.4? Lockngo for Mac is a security application that runs directly from your portable drive (with absolutely no installation). Lockngo encrypts and password protects your data against loss or theft. When protected, your drive will appear empty (data is hidden) and will not allow for new data to be written onto it. Lockngo has Military Grade 256-bit AES Encryption, FIPS 140-2 Certified. A cross-platform version of Lockngo (which runs on Mac and Windows) is also available. 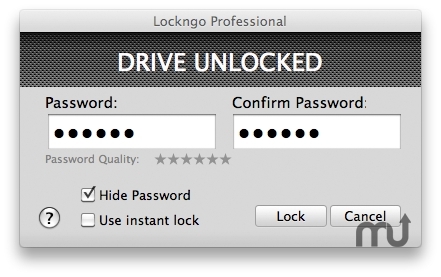 The demo version contains Lockngo for Mac and Lockngo for Windows. Feel free to try one or both.